The second time traveling out west in Charleston’s program history will feature a match against a likely top-10 national ranked team. Charleston informed Off the Black that during the upcoming season it will play UC Irvine as part of a non-conference event at Grand Canyon. This will be the first all-time meeting between the Golden Eagles and the Anteaters. It also will be the first time that Charleston has played a West Coast team since 2016. Charleston finished last sason with its first winning record in the program’s four-year history. The team also opened the conference season sweeping a two-match series against Princeton for its first EIVA victories since joining the league. Among the starters returning for the Golden Eagles next season includes outside attacker Max Senica. 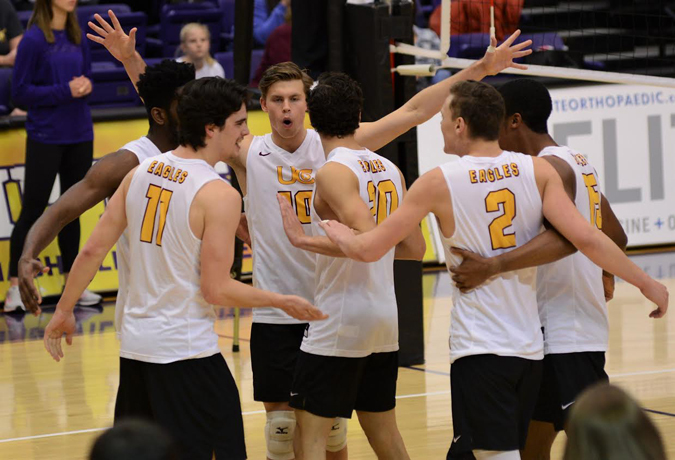 Senica as a freshman last season was among the conference leaders averaging 2.45 kills per game and in the offseason helped Australia reach the Asian Men’s U20 Volleyball Championship quarterfinals. UC Irvine earned the final at-large bid to the 2018 NCAA Tournament and ended the season ranked in the top six of both the national coaches poll and national media poll. The Anteaters return three First-Team All-Big West starters. Along with his conference honors, All-American middle attacker Scott Stadick was named the 2018 Off the Block/Springbak, Inc. National Blocker of the Year after finishing the regular season second in the nation with a 1.32 kills per game average. Charleston has never defeated a nationally ranked team in its program history. The Golden Eagles will play three matches during this non-conference event at Grand Canyon on Feb. 1-2. Besides its tournament-opener versus UC Irvine, Charleston will play Benedictine Mesa on Feb. 1 and then Grand Canyon on Feb. 2.